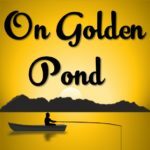 Tickets for “On Golden Pond” are now available for purchase online through our website. Please visit our web page for show details. Tickets will be available at the Coffee House on Chestnut and Pine Streets in Burlington after April 26, 2018.